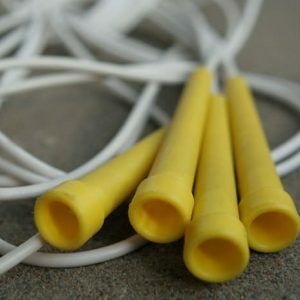 A quality jump rope is the most essential tool in rope skipping! The main thing to look for in a good rope is how easily does the rope turn inside the handle. If it doesn’t turn freely, your rope will kink up at the bottom making jumping next to impossible. 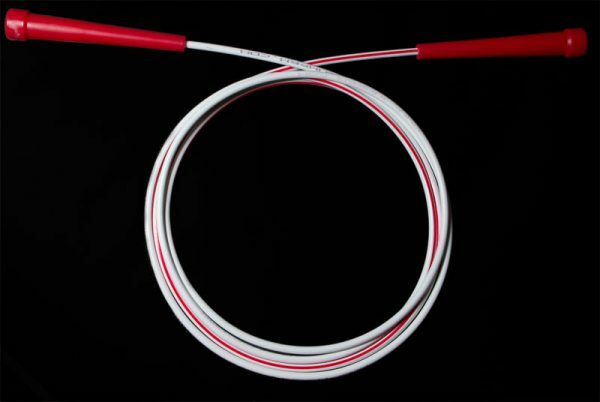 Our ropes use an exclusive ‘skiiver’ that is low profile and keeps the rope turning with ease. You also want to use a rope that weighs enough to slice through the air easily, but not too heavy so that you are overworking your arms. Our speed ropes are lightweight, have handles that rotate smoothly and will give you an awesome workout! The only other thing you need to know is how to size your rope. When you stand on the middle of the rope with both feet, the handles should come up to around your armpits. It’s OK to jump with a rope that’s a bit shorter or longer than that, but too much in either direction and you will be missing constantly. If your rope is a little bit too long, you can add a knot under the handle to shorten it. Remember, never put a knot above the handle or the rope won’t turn. Our action ropes are available in a custom white with red stripe and you can choose your handle color (red, orange, yellow, green, blue, pink or purple). A general guide line to use is if you’re under 5′ tall, get a 7′ rope, if you’re 5′-5’6″ tall, you should get an 8 foot rope, 5’7″ – 6′ get a 9 foot jump rope, if you’re taller, get a 10′ rope. Good rope-I like knowing I’m doing the work-no bearings. I am very particular about the rope I use. The speed rope I had been using was discontinued. After searching and trying ropes from a few companies, not only was this the best of the bunch but it surpassed my former favorite. The handle took a bit of getting use to but now fits my hand like a glove. The cord has nice pliability and the right weight for me. And the color is cool too. Just ordered some more to have some spares around just in case. I don’t normally write reviews but I feel passionate about this rope. This rope is by far the BEST rope I’ve ever used. I have dozens of ropes that I’ve bought and tried. What’s unique about this particular rope is that it is PERFECTLY balanced, the handles rotate freely, and most importantly, move in the same direction of the rope as a single unit which is especially important when doing rope releases. The handles are small but I’ve found them to be perfectly matched for the rope like no others and is the easiest for me to learn freestyle. Also, I can’t tell you how many handles I’ve destroyed trying to learn the mamba, but these handles WILL NOT break. 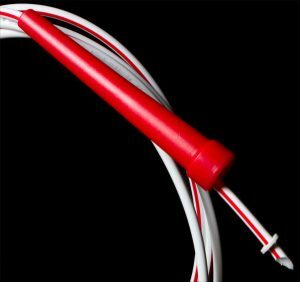 This rope makes it easy to do crosses, front to back transitions, and really is the perfect jump rope for speed and any freestyle tricks! You will not be disappointed with this rope. ABSOLUTELY 5 STARS! !